Starting a non-profit theater company isn’t easy. Bringing in enough money to keep it running isn’t easy. Finding the perfect place to call home isn’t easy. Securing the funds necessary to make our dream of a new, professional theater venue in the City of Wilmington a reality isn’t easy. But, if it were easy, everyone else would be doing it. Bootless loves challenges both on and off stage! WHAT IS EASY – Clicking below to make a tax-deductible donation. 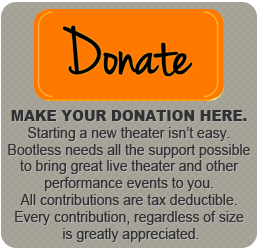 Bootless needs all the support possible to bring great live theater and other performance events to you. Your tax deductible donation is an easy and simple step in supporting the arts in Delaware. Every contribution, regardless of size, is greatly appreciated. When you make a donation to Bootless you will receive great gifts ranging from free tickets to invitations to cast parties. Certain gifts come with more than just bragging rights, but naming rights as well. Items available for naming include the stage, green room, equipment and more. See below for complete list of donation levels and thank you gifts. Donate $50 or more to Bootless between August 1, 2018 and March 30, 2019 to receive a Bootless wristband identifying you as a Bootless VIP entitled to receive complimentary drinks & snacks at our shows. Wear your wristband to the performance, show it to the peeps working refreshments, and enjoy yourself silly. Should you wish to become a Producer and underwrite the cost of a production, please e-mail us at contactus@bootless.org. I am interested in underwriting a portion of a production. My donation is in support of Bootless’ Capital Campaign for on-going renovations to the theater. All donors at this level will be contacted by a Bootless Representative to determine what particular item will be associated with your donation.